You know when it comes to anything new in the city, we are your go-to guide. So, we have done our research and found you 10 new restaurants, bars, and cafe in Bangalore that you need to check out in 2019. Some of them are doing live counters, while others are serving craft beer, and then there's also places doing healthy food! Go on, start the new year with some new eateries! Favourites and loyalists of Biergarten Whitefield will be happy to know that the second outlet is a lot closer to the city. Thank god for that! The best part is beer is already on tap with from what our Insider Akash Hirebet told us, they are going to have up to 10 beers on tap. We'll drink to that given that there's DIPA, Golden Ale, and from what we here, a Red Ale too. The menu has gotten an update too and there's Medu Vada Pops and Nalli Ka Salan. 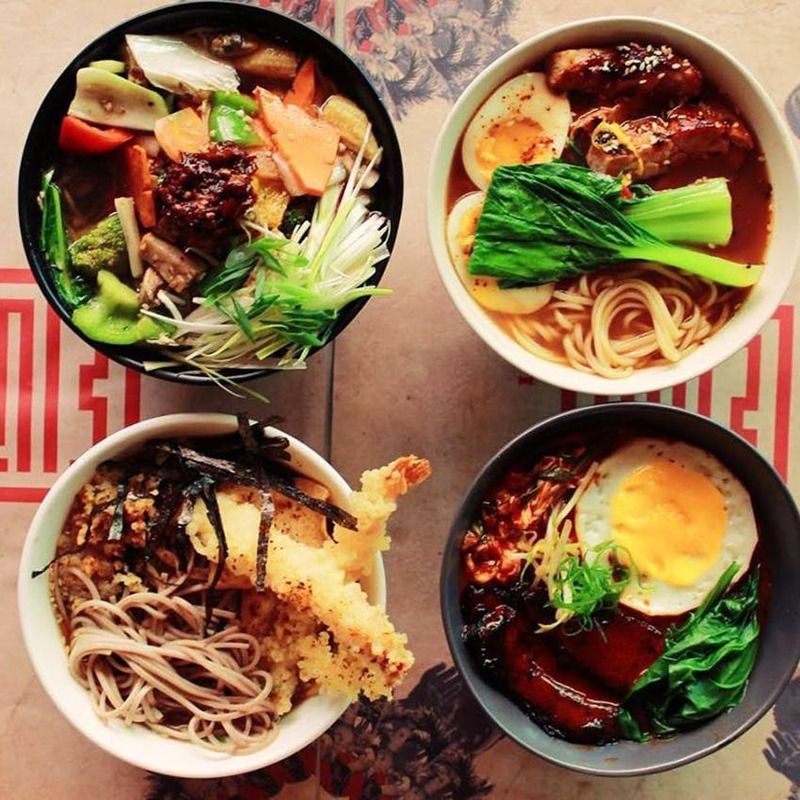 Misu's second outlet has ramen on the menu and that's one thing to look forward too. But besides that, the swanky and chic space retains the same elegant decor and vibes that the original on St Marks Road has. Hurrah for that! Naturally, the new space means ordering flawless dim sums, especially the Rainbow Dumplings, sushi, and soba noodles, and Hainanese Chicken rice and sushi soon. JP Nagar's nightlife scene is popping and Levitate is one such place that's got a great vibe and Insta-worthy decor set up. The whole place is done up with barrels, chairs, and other props that seem to levitate on their own (hence the name). Not to mention that the rooftop is our favourite spot that has plenty of cosy spots for date nights. Food is Continental, Asian, Bar Bites, and North Indian, so you get Tandoori Aloo as well as Cajun Honey-Lime Chicken Wings along with pizza and naan-chicken tikka masala. Oh, and there's already eight craft brews including pilsner and lager on tap. Yup, their microbrewery is already up an running. Drava the latest entrant to Koramangala's bar and nightlife scene ditches the loud and colourful vibe that many Koramangala pubs have for a more relaxed and lounge-like setup. We are talking about laidback couches, bar stools around the huge bar, and open-air seating. It's perfect for those fun nights in Koramangala when you just need to chill with a drink and some good catch up sesh with the gang. Potent drinks with cheeky names such as Kama Sutra should ensure everyone leaves for home happy. Bar bites and pizza will keep the energy going. If you are a sucker for Pan-Asian, the new kid on the block has an extensive menu featuring the best of China, Korea, Japan, Indonesia and Hongkong. We are talking about dishes such as Murtabak with Lamah Masak, Lobster dumplings that are served with Xo Beurre Blanc sauce, and even The Great General Tao’s Favourite Chicken and Three Lung Har Gow. There's also live Dim Sums station that serves Pak Choi and Shiitake Dumpling, Ginger Chicken Jiaozi and Prawn & Crabmeat Dumpling. There's a bar too, so you can pair your meal with oriental-inspired flavoured cocktails. The chances are when you are driving down 100 Feet Road Indiranagar, you'd have seen the pyramid roof of Arena. The dimly lit interiors look futuristic with shiny metallic accents all around and very aesthetic with the whole minimal decor theme going around. You've got plenty of space to host private parties and the DJ space upstairs is where you can let your hair down and party. There's also a basement seating if you are wondering how huge the space is. The cocktails are crafty and potent - try the Popcorn and Apple Pie cocktails which are their signature and what we liked. The menu is Asian and Continental so say hello to Japanese pork gyozas, Nachos, sushi, and plenty of small plates and flatbreads. You will love how beautifully the space is done up with greens all around including hanging ones, high ceiling with mirrors on them, plush couches and chairs, and a very retro-looking bar. This one is for those nights when you dress your best and need to click a 100 pictures for Instagram. Totally chic and party-central vibes this place has! Regular tipple is there for all those after work sundowner but for those fun nights, we recommend the Nevermind Essentials, their signature cocktails that includes a The Good Wife and a range of smoking cocktails which includes Smoking Violets. The menu is world cuisine meets Modern Indian and All Day Bites are what we are rooting for because it has Peri Peri Chicken Strips and Achari Broccoli. A menu that's inspired by spa cuisine, Sante's menu is made using fresh and natural ingredients. An all-vegetarian extensive menu you've got everything from smoothie bowls, all-day breakfast options, pizzas, salads, and homemade soups. If 2019 is the year of healthy eating, then you've a new place to check out. Oh, and lest we forget, the whole space is set inside a bungalow with lots of natural light and minimal decor. 12th Main is getting tacos and we are amaized! Sorry, we couldn't help ourselves but Sanchez has a live taco bar, guys! Nothing like watching some signature tacos like Mexican Blue Corn Hard Tacos, Sea Flavored Charcoal Corn Tacos, and Modern Soft Roasted Beet Corn Tacos. We'll taco about (sorry last pun) rest of the menu which includes avocado toasts made from in-house Bolillo bread, Garnachas and Chilaquiles, and Tex-Mex wet Burritos topped with a choice of sauces. Don't forget to order the margaritas with seasonal fruits as well as micheladas and a range of tequilas. Just above Sanchez, Sriracha is bringing contemporary Pan-Asian to Indiranagar along with a live Robatayaki grill and Cambodian Khmer cuisine. If you are wondering what Khmer cuisine is, it's basically smoking meats and vegetables on live charcoal and surrounded with soup on the outside. The restaurant is set to open soon, so what out this space for more!